In 1989, driven by a dream and the memory of her own past, Christina Noble travelled 6,000 miles to Vietnam, a country of great beauty where the terrible legacy of war is still being felt. Against extraordinary odds she opened the Christina Noble Children's Foundation, providing medical aid and schooling. Through this foundation the street children could find safety and new beginnings under the protection of 'Mama Tina'. In this vivid and moving book Christina's story continues with the amazing tale of what she and her foundation have achieved. She takes us from the streets of Saigon to the children's prisons of Mongolia. Finally she returns to Dublin where she is greeted by the president of Ireland herself. A staunch campaigner for children's rights, for Christina there are no frontiers, only a world filled with children reaching out. 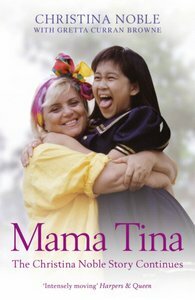 About "Mama Tina: The Christina Noble Story Continues"
Christina Noble was born in the slums of Dublin city. At the age of ten her mother died, and her alcoholic father could no longer care for her or her siblings. In the years that followed she suffered physical, emotional and sexual abuse in orphanages and on the streets, and after her marriage she was the victim of domestic violence. One night she had a dream about the street children of Vietnam and decided to make it reality. In 1989 she set up the Christina Noble Children's Foundation in Ho Chi Minh city and in 1997 she expanded it to Mongolia. To this day she continues to devote her life to improving the lives of the street children. Expected to ship within 14 hours from Australia.